Carpet Cleaning Kent - Look no further. We promise to provide the lowest quotation possible and the high quality service. Give us a call today for prompt and efficient service at a reasonable cost. Cleaning Professionals Carpet Cleaning Kent provide second to none carpet cleaning service. Carpets can be the longest suffering part of any home or property. Whether you have pets with muddy paws, children treading food or the inevitable wine spillages that always take place during an event, the carpet has always been there to absorb it. Clean Professionals Carpet Cleaning (Kent) are the perfect artists for reviving your carpets, would you believe we can make them appear as good as new? This means no need for any replacement if maintained. Clean Professionals Carpet Cleaning Kent also provides Commercial Carpet Cleaning for various sectors and types of buildings or businesses. Clean Professionals Carpet Cleaning use the most advanced modern machinery available on the market today. Not only do we have certified professionals to clean carpets, we can clean upholstery too! Clean Professionals Carpet Cleaning Kent is the best end of tenancy carpet cleaning service at the most affordable rate and we clean commercial carpets too. 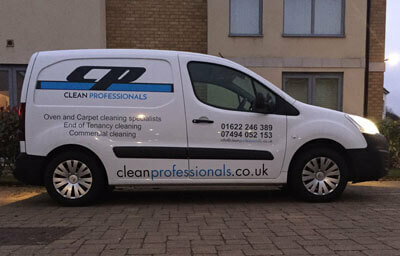 For a free quotation, why not give Clean Professionals Carpet Cleaning Kent a call today? After pre treatment of the carpet and gentle agitation a specially designed steam/hot water extraction machine is used, cleaning solution is injected into the carpet fibres of the carpet at high pressure, Our water jet nozzles on our machines allow us to penetrate deep into the fibres as the vacuum slot extracts the dirt and debris hidden in the carpet loosening all soil and grease particles in one simultaneous action. It is highly recommended that you have your carpets professionally cleaned once every six to twelve months to keep them feeling fresh and looking pristine and most importantly to prolong the life span of the carpet and prevent allergen build up.